My family and I have been on a Panera Bread® soup craze lately. We absolutely love their vegetable soup (without pesto), but around here where we live, they only serve this delicious soup on certain days. So, we decided to make our own. 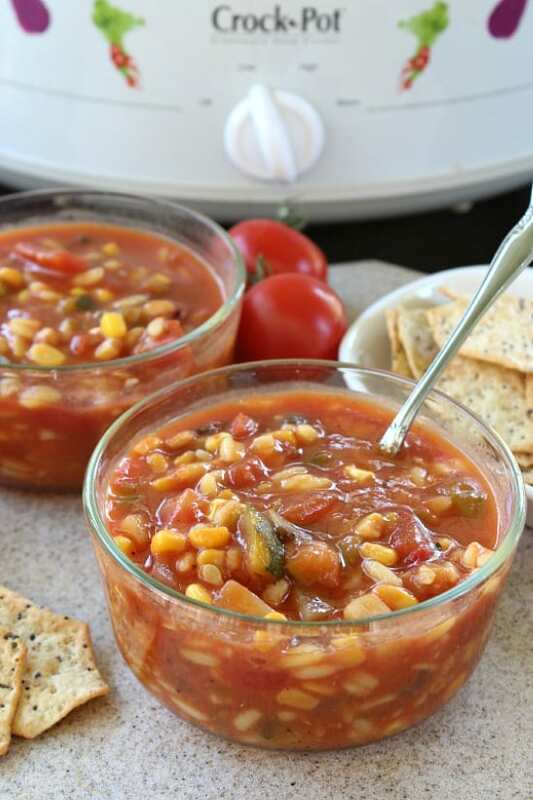 This tomato garden vegetable soup is our own version. I know it’s not like Panera’s, but it works if you are craving tomato vegetable soup. 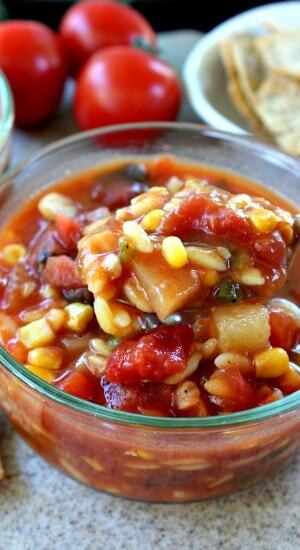 This tomato garden vegetable soup is loaded with healthy veggies and orzo. 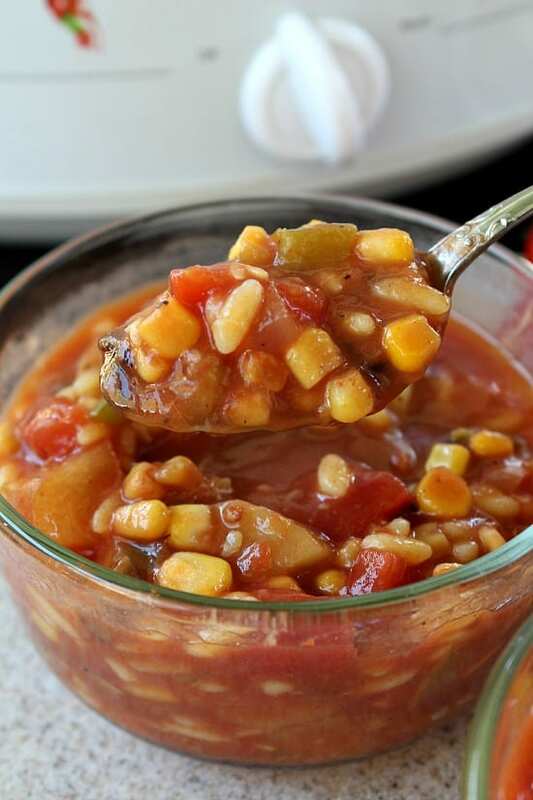 You can add additional vegetables of your choice, anything goes when making a delicious vegetable soup. Be creative and add other spices and herbs that your family enjoys. This soup is not spicy, so if you want more spiciness, just add more Cajun seasoning or even some jalapenos. We really enjoy spicy food. 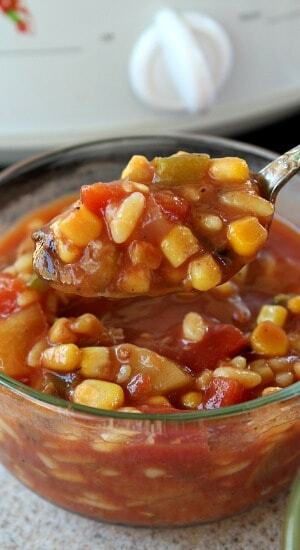 You can also make this on the stove if you do not have a crock pot, or if you want your soup to finish cooking sooner. As this soup is cooking, if needed, add in additional broth or water to desired consistency. I know it’s finally hot around most of the country, but this soup is delicious no matter what kind of weather we are having! Enjoy this delicious soup! I love making huge amounts of food so I can freeze what is left over for future meals. I put 2 cups in each freezer bag. The freezer bags lay flat and you save room in your freezer that way. Just stack the bags on top of each other. Don’t forget to label the bags and put the date on them. In a 7 quart crock pot, add vegetable broth, diced tomatoes, tomato sauce, tomato paste, water. Stir. Dice potatoes, squash, zucchini, bell pepper, mushrooms, onion into small pieces and add to crock pot. Add chopped garlic, cajun seasoning, salt and pepper. Cover and cook on high for 5-6 hrs,or low 8-9 hrs. Add corn and orzo the last hour of cooking. 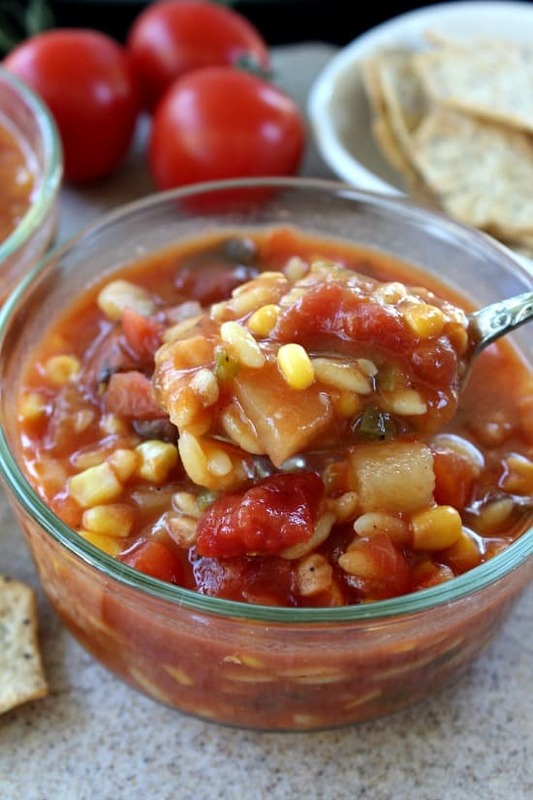 I love a good vegetable soup and this one looks and sounds awesome! I will definitely be making this recipe. Raley’s supermarket has a great vegetable soup also. I always buy some when I shop there.